It all started in April 2008. When we were meeting in Urmila’s house, she said,’Thatha would have been 100 in 6 months. We must do something about it.’ It was from this germinal thought that the Centenary Celebrations were conceived. We wanted to tell the tale of everyone who was touched by my father and mother in a special book to be brought out. We wanted to display forgotten photographs. We wanted to have a get- of all relatives, family-friends and my father’s students together (with items of food that my father liked). We wanted to do much more, but reined in our enthusiasm as we were keen that the celebrations should reflect my father’s personality and should be good and appropriate rather than grandiose. -- serve to all guests items of food liked by my father. Preparations actually started only in October 2008 when we booked the hall. 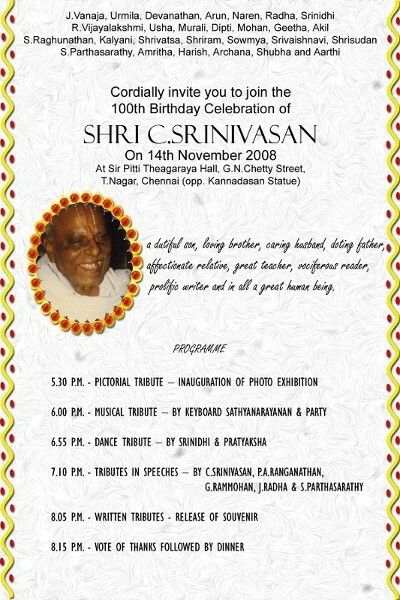 All other activities - contacting people for articles/anecdotes, sending out invitations, fixing up Sathyanarayanan's concert, getting Srinidhi and Pratyaksha ready for the Dance Tribute, fixing up speakers, deciding menu and arranging the caterer etc. - quickly followed. We are happy that the celebrations went off very well in Sir Pitti Tyagaraya Hall in T.Nagar and was fairly well-attended. Apart from the planned programme. I got my third book (Romance of The Railways) released (without the CD-ROM). The rain gods co-operated and gave rains to Chennai from the day after the celebration.